Greetings to all! 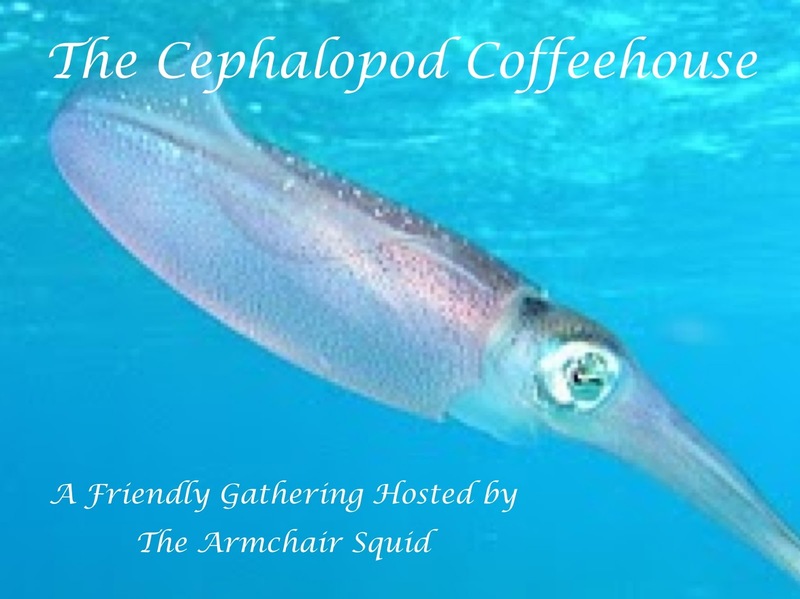 I hope you'll join us for the next installment of the Cephalopod Coffeehouse, an online gathering of bloggers who love books. The next meeting is set for Friday, March 27th. If you're interested, please sign on to the link list at the end of this post. 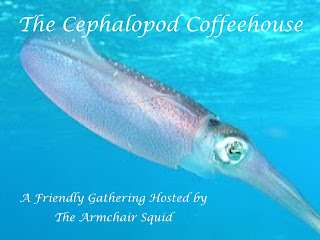 Welcome one and all to the Cephalopod Coffeehouse, a cozy gathering of book lovers, meeting to discuss their thoughts regarding the tomes they enjoyed most over the previous month. Pull up a chair, order your cappuccino and join in the fun. If you wish to add your own review to the conversation, please sign on to the link list at the end of my post. 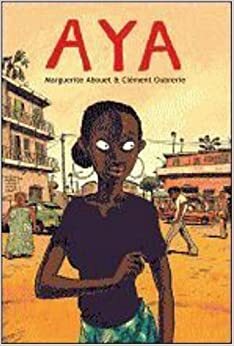 Aya is the first in a series of graphic novels about the writer's experiences growing up in Ivory Coast in the 1970s. The '70s were a time of relative stability and optimism in West Africa, after independence but before the destructive horrors of civil war. So, Aya doesn't dwell on the topics we've come to expect from African literature like war, famine and disease. Instead, it offers a slice of life from a part of the world most of the rest of us know nothing about. The titular character is a teenage girl, a bit older than the author herself would have been at the time. She is sweet, responsible and ambitious but her friends just want to go out dancing with boys. The main story of this first edition centers on one friend, Adjoua, who finds herself pregnant. But who is the father? In fact, the basic plot isn't specific to Africa at all - could just as easily take place in an American or European city. Since the age of twelve, the author has lived in France, where the book was first published. The illustrator is her husband, Clément Oubrerie. The series - six volumes in all, four translated to English so far - has been very successful in France, even spawning an animated film. I'm definitely interested in reading more. Please join us and share your own review of your best read from the past month. This month's link list is below. I'll keep it open until the end of the day. I'll post March's tomorrow. Meetings are the last Friday of each month. Next gathering is March 27th. Over the past two years, I have watched every single episode of Star Trek's original series, most of them for the first time in my life. I began my journey with a question: how did this show, one that struggled to stay on the air, manage to become one of the dominant forces in worldwide science fiction? Star Trek was even lucky to be syndicated, having only completed three seasons in an era when most shows weren't considered without at least four. But those three seasons eventually begat another 27 over five spinoff series plus twelve feature films, the most recent pulling in $467 million at the box office. A 13th movie is already in the works for release in 2016, the 50th anniversary year of the franchise. Take that, Bonanza! How did this happen? What is it about this one science fiction program that inspired such a legacy? To be sure, the quality of stories was strong in the beginning, the characters appealing. World building was excellent, though that could be said for any number of other shows on TV in the late 1960s. High tech sci-fi was fun but not exactly unprecedented. No, there was something more to it. Over time, as I got to know the characters better and understand the relationships between them, I believe I figured it out. Or at least I found what makes Trek work for me, which seems as good a place to start as any. Trekkies traditionally fall into two camps: those who prefer the original series (TOS) and those who prefer The Next Generation (TNG) and its successors. I went into this adventure with a strong TNG bias. I knew the later show better and preferred, among other things, its stronger character development, long one of the main arguments from the TNG wing. Most of TOS focuses on three characters: James Kirk, Captain; Spock, First Officer, and Leonard McCoy, Chief Medical Officer. Back stories on even those three are scant in comparison to the rich personal histories granted TNG's Enterprise crew. 79 episodes later, I still feel the argument falls in TNG's favor. But the argument misses the point. The original Star Trek is ultimately driven not by the individual characteristics of the three leading men but by the dynamics of the relationship between them. Any casual fan could tell you that Spock is the constant, reliable voice of Logic. It doesn't take long, then, to recognize the temperamental McCoy as an advocate for Emotion. In weighing the input of his two advisers, Kirk must exercise Judgment. Sometimes, he decides in favor of Spock, other times McCoy, but usually somewhere in between. The consideration is the important thing as the three lead their faithful crew in exploring the unknown. But to what end? This id-ego-superego arrangement was all very clever but not enough to explain small children wearing Vulcan ears at ComicCon nearly half a century later. A quick glance around the Enterprise bridge set offers other clues. Over the captain's right shoulder sits Lt. Uhura, Chief Communications Officer, an African character played by an African American woman. In the foreground are Lt. Sulu, Helmsman, and Ensign Chekov, Navigator. Sulu is played by a Japanese American who had spent part of his childhood in internment camps. Chekov is portrayed as Russian. Those choices were not accidental. Star Trek, like any creative expression, was a product of its own time and place. Casting an African American woman in a position of authority for the first time in American television history was no subtle gesture during the ongoing Civil Rights Movement of the mid-to-late '60s. Nor was creating a sympathetic Asian character at a time when the nation had been at war in East Asia for much of the previous quarter century. Nor was establishing a likeable Russian character during the darkest depths of the Cold War. And let's not forget, there was that guy with the pointy ears, too. In 1966, many Americans were marching, others burning draft cards, others forming a new counterculture - all in protest of government policies. Gene Roddenberry, a former military pilot and policeman who had seen plenty of the world's evils first hand, didn't do any of those things. Instead, he created a television show. Roddenberry sold Star Trek as "a Wagon Train to the stars." But his vision for the project obviously ran a lot deeper. The strongest forces in American science fiction to that point had been Flash Gordon and B-movie horrors. In both idioms, the approach to alien life forms was get them before they get us. Along with the bright colors, the cool gadgets and all the other bells and whistles, Star Trek brought a new approach to confronting "the other." Those folks working together on the bridge of the Enterprise were a sign of a more enlightened time in Earth's history. Having learned to get along better with one another, humanity was worthy of engaging with alien species. Encounters with unfamiliar beings would not be driven by conquest, exploitation or conversion. We would learn from the new, not destroy it. The early converts were few but devoted. For the broader populace, the idea required simmering. Two decades later, when new stories found their way to television, the names had changed but the basic philosophy remained. In the end, it hardly matters if one prefers Kirk or Picard. Star Trek is no one character or even cast of characters. Trek is an approach to the unknown, weighing Logical and Emotional considerations with thoughtful Judgment. Trek is hope for a better world. That's why we still care 50 years later. Favorite Episode: "Journey to Babel"
Sarek and Amanda, Spock's parents, are aboard the Enterprise en route to a diplomatic conference. Sarek suffers a "cardiovascular malfunction." Only a transfusion of Spock's blood can save him and the son readily submits to an experimental procedure to save the life of the father. Duty to the Enterprise, however, interferes with the treatment and Spock must choose between his loyalties to family and Starfleet. Sarek and Spock both know logic dictates that the mission should come first but Amanda, Spock's human mother, disagrees. She confronts her son in private. When Spock stands his ground, she slaps him and storms out of the room. We never see Spock's face after the slap. He moves towards the closed door and rests a hand on it. That simple gesture tells us everything we need to know about Spock. No contest: Trek's finest moment. Least Favorite Episode: "The Way to Eden"
The Enterprise picks up a band of hippy types in search of their own utopia. They sing truly awful songs. There are probably weaker stories in Star Trek but none made me cringe quite like those songs. You can talk Kirk vs. Picard all you want. There's only one Spock. As much as I've grown to appreciate both Kirk and McCoy, the half-Vulcan first officer is the iconic face of the franchise. I don't always agree with him. I don't even always like him. But picking either of the others as my favorite would feel disingenuous. Many of the best stories in Star Trek revolve around his self-identity struggles. All due credit to Leonard Nimoy, easily one of the greatest casting choices in the history of television. Lt. Nyota Uhura was a revolution all her own. Nichelle Nichols was one of the first African-American actors to be cast on American television in anything other than a servant role. None other than Dr. Martin Luther King, Jr. was a fan of Star Trek, thanks in no small part to Uhura. Nichols met King after the first season and confessed that she was thinking of leaving the show to resume her stage career. Citing her cultural significance, he convinced her to stay. Uhura is more than just a political statement. Of Trek's second tier of characters, she is the most nuanced. On the bridge, she projects a confident, yet gentle demeanor. In the officer's lounge, she sings to her crew mates. Nichols herself has admitted that her favorite stories are the ones in which she wears civilian clothes and projects a more sensual femininity. Lenard appears in two of my favorite episodes as two entirely different characters. In the first season's "Balance of Terror," he is the unnamed Romulan Commander. In "Journey to Babel," he is Sarek, Spock's Vulcan father. In the first story, he achieves a remarkable combination of bone-chilling and heart-wrenching in his final communication with Kirk as his own ship crumbles around him. In the second, he provides an unforgettable prototype for the stoic Vulcan male. "The Corbomite Maneuver" - The first, clear glimpse of Star Trek's moral compass. "Balance of Terror" - Our introduction to the Romulans, this was my favorite first season episode. The exchanges between Kirk and the Romulan Commander are exquisite. "Space Seed" - We meet Khan, one of Star Trek's most important recurring characters. Again, the highlight is the verbal sparring between Kirk and a powerful nemesis. "Errand of Mercy" - Our introduction to the Klingons. The Federation and the Klingon Empire vie for control of the planet, Organia. The natives are peaceful and seemingly helpless. In a wonderful turn, the Organians turn out to be quite powerful indeed and send both of the other parties away with a good scolding. Our heroes aren't morally irreproachable after all. "City on the Edge of Forever" - The most revered episode of the original run, I can't say it's my favorite. It's a time travel narrative and Star Trek doesn't usually do well with those, in my opinion. But the overall quality is undeniable and I would not be a good guide if I did not include it in my tour. "Amok Time" - We get to visit the planet Vulcan. Enough said. "Mirror, Mirror" - Through a transporter malfunction, Kirk, McCoy, Scotty and Uhura find themselves in a parallel universe where the Enterprise functions within entirely different moral parameters. The cultural meme of evil twins with goatees derives directly from this episode. "The Journey to Babel" - My favorite of the whole bunch. See above. "The Trouble with Tribbles" - A much mocked episode by the uninitiated, the tribbles tale is actually quite clever, a highly effective demonstration of narrative misdirection. It was nominated for three Emmys and a Hugo. "The Enterprise Incident" - One third season episode made it on the list after all. Kirk and Spock infiltrate a Romulan ship in order to steal its cloaking device. We learn a lot about the Romulans in this story, mostly through the ship's commander, one of Star Trek's best female characters. The fun continues next week. Beginning Wednesday, March 4th, fellow blogger Maurice Mitchell and I will be exploring Star Trek: The Animated Series one episode at a time. You're welcome to join us! Details are here. Poetry is an ancient and revered art form in the Arab world. Verse consistently outsells prose many times over. Adonis, Darwish and al-Qasim are three of the most prominent modern practitioners. Darwish and al-Qasim, both now deceased, were Palestinian. Adonis is Syrian. 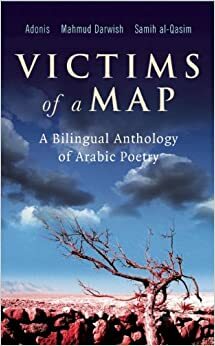 The lives, careers and poetry of all three were shaped profoundly by the political turmoil of the region, thus this collection's wonderful title: Victims of a Map. The book contains 45 poems in all, 15 from each writer. Each is printed in both Arabic and English, some for the first time in either language. I don't know if I'm a poetry person. I enjoy it. I admire it. But I don't know if I'll ever be one to happily curl up with a book of verse for hours on end. I've tried: Byron, Shakespeare, Frost, haiku, etc. It's lovely a little bit at a time, like a literary snack. But as an entree? I just don't think it's me. The longest piece is Adonis's "The Desert (The Diary of Beirut Under Siege, 1982)" with 35 stanzas. The imagery of the poems is beautiful and disturbing. I'm sure I'm missing a great deal without being able to experience the text in the original language but so it goes. Of the three, I enjoyed al-Qasim's style the best: short, economic and potent. "87th Oscars" by Source (WP:NFCC#4). Licensed under Fair use via Wikipedia. Since the last time I posted about Roger Angell (here), he has been awarded the J.G. Taylor Spink Award, the highest honor given by the Baseball Writer's Association of America. The National Baseball Hall of Fame has a permanent exhibit dedicated to the award and its recipients. The Summer Game is a collection of some of his earliest New Yorker columns on baseball, encompassing the seasons from 1962 through 1971, a period of great transition in the national pastime. I had read a few of the chapters before but there was plenty of new material, too. As I have written of Angell before, his season synopses can be tedious - not unlike the endless "begats" in Genesis. There's only so much I can bring myself to care about the intricacies of a mid-season game in August 1967, for instance. Even so, the author's playful, elegant language catches the eye from time to time: likening a pitcher facing the heart of the opponent's lineup to opening a box of cobras. Angell's most engaging pieces come when he takes a step back from the game, exploring the implications of moving and expanding leagues, the rise of television, the wonders of AstroTurf and domed stadiums, the encroachment of professional football and so on. Angell writes wonderfully about the stars of the day. A few, like Denny McLain and Vida Blue, never quite lived up to early projections. Others, like Willie Mays and Roberto Clemente, reside comfortably in the game's pantheon. He describes Clemente "playing a kind of baseball that none of us had ever seen before - throwing and running and hitting at something close to the level of absolute perfection, playing to win but also playing the game almost as if it were a form of punishment for everyone else on the field." For me, much of the fun of this particular collection derives from the fact that the time period includes the glory years of my own favorite team, the Baltimore Orioles. From 1966-71, the Orioles won the American League pennant four times and the World Series twice. They won more than 100 games in three consecutive seasons (1969-71) and also swept the American League championship series in each of those years. The 1970 team is generally considered to be one of the best in baseball history. In 1971, they had four 20-game winning pitchers. In short, Baltimore was the premier franchise in baseball and, even more importantly, a place where players were happy playing. 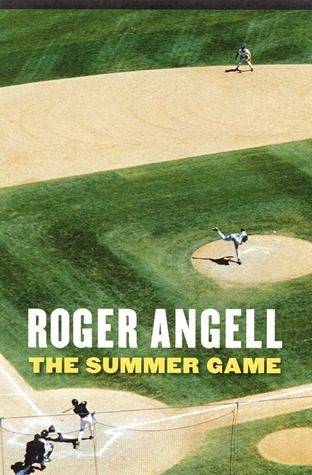 I don't know if a non-fan would get much out of Angell's work but for anyone who already loves baseball, it's a must-read. This edition is top-heavy with season synopses but it's still plenty good. Initially, I was planning to take a break from Star Trek after completing my goal of watching and blogging about all 79 original series episodes. But when fellow blogger Maurice Mitchell said he would be interested in watching The Animated Series along with me, I jumped at the chance. We'll be blogging every Wednesday, beginning with the first episode, "Beyond the Farthest Star," on March 4th. We invite others to join us, too! The following is our link list for the project. Unlike with the Cephalopod Coffeehouse or Mock Squid Soup where I post a fresh list each month, I'll maintain a single, perpetual list for this. I realize not everyone will be up for watching the entire series but if folks are inclined to pop in from time to time, I'm happy to add and remove links as appropriate - no hard feelings. And just like that, it's over. I've reached the end. All 79 original series episodes, in the bag. Geek cred officially enhanced. On the night "Turnabout Intruder" was originally scheduled to air, March 28th, the network preempted with a report on the death of Dwight Eisenhower earlier in the day. In June, NBC moved the show to a new time slot: 7:30 on Tuesdays. "Turnabout Intruder" was the first and last new episode to air in the new slot. No one could have known it at the time but the franchise was about to take on a whole new life through the magic of syndication. "Turnabout Intruder" is a popular choice for Trek fans' worst-ever lists. I didn't think it was quite so horrible though I do understand the feminist objections. In response to a fake distress call [They fall for it every time...], our friends arrive at the planet Camus II, site of an archaeological expedition. Among the only three survivors is Dr. Janice Lester, an ex-girlfriend of Captain Kirk's from his clearly eventful Academy days. [Considering the number of women ol' Jim was nearly married to at that point in his life, it's a miracle he graduated!] Through mysterious technological trickery, Lester switches bodies with Kirk, fulfilling her unrealized ambitions to become a starship captain. The objections to the episode tend toward two elements: William Shatner's campy portrayal of a woman in a man's body and the sexism implied in Lester's character. The latter I understand completely. I'd like to believe that sexual politics have progressed a great deal since 1969 but popular culture still has difficulty generating female characters who are simultaneously ambitious and likeable. Shatner's overacting, on the other hand, should hardly come as a surprise at this point. And to his credit, I don't think he comes off as effeminate so much as a man unaccustomed to his own body - true to the part. [I sense some wardrobe help, too - pretty sure he's wearing a girdle to aid in his overemphasized manly posture.] I realize this isn't exactly a ringing endorsement, but it could have been a lot worse. The story provides an interesting send off for the series. While possessed by Lester, the captain adopts uncharacteristic mannerisms - for instance, referring to himself as "Captain Kirk" as opposed to simply "Kirk" in communications - that arouse the suspicion of his fellow officers and serve as a wink to knowledgeable fans. Also, Lester (inhabited by Kirk) makes several references to previous episodes in an effort to convince Spock of his true identity. Overall, it would have been nice for the series to end with a stronger story but again, it could have been worse. The third season is much maligned by the devoted and not without cause. Formula, once so elegantly avoided, was now the rule. Eye roll inducement was ever on the increase. Some stories were just plain dull, an unforgivable sin for science fiction. Even cast members were raising objections to the garbage that was being thrown their way. I don't know if a single episode from the season will make it onto my must-watch list (to be included in next week's post). And yet, there are moments. Kirk's kiss with Uhura was a genuinely revolutionary event in American television. Dr. McCoy gets much needed development in the third season, especially in terms of his relationship with Spock. Characters other than Kirk are allowed romantic adventures. None of this was enough to save the show from cancellation but it did broaden the canvas to be filled by future series and films. Favorite Episode: "The Enterprise Incident"
Romulans only appear in two episodes of Star Trek's original series. The first was "Balance of Terror," easily one of my overall favorites. In "The Enterprise Incident," Kirk and Spock infiltrate a Romulan ship in order to steal its cloaking device. Along the way, Spock has a brief, disingenuous romance with the Romulan commander, a far more interesting female character than Dr. Lester, to be sure. The story adds a great deal to our understanding and appreciation of the nature of one of Star Trek's long-standing antagonist races. I will concede that other stories may be weaker overall but the horrendous songs performed in "The Way to Eden" are more than enough to warrant such distinction. Several who commented on my post suggested that the tunes may have been intentionally bad. Somehow, that only makes matters worse to my mind! Once again, my favorite guest star coincides with my favorite episode. Linville played the Romulan commander in "The Enterprise Incident." Her on-screen chemistry with Leonard Nimoy is exceptional. The two invented intimate gestures to take the place of human kissing. Someday, I may continue with Trek. Next up would be the animated series which ran in the early '70s. But it's a good time for a break. I'll post my overall reflection next week, after which my Wednesday posts will head in more gastronomical directions. In June 1969, one of humanity's greatest moments was right around the corner. On July 21st, American astronaut Neil Armstrong set foot on the Moon. Perhaps Roddenberry's vision wasn't so fantastical after all. Let's get cracking on that Warp Drive, folks! Also in June of 1969, Gold Key Comics released the fourth issue in its Star Trek series: "The Peril of Planet Quick Change"... terrible title. An interesting coincidence: the comic book story also involves possession by a hostile entity, though Spock is the target this time. Our heroes, casually cruising through another galaxy (never happens on TV), come upon the strange planet Metamorpha. As its name suggests, the planet is flying through epochal changes over a matter of Earth minutes. While on the surface, Spock's brain is invaded by bright, shiny, disembodied entities who guide him to the solution to the planet's ills. Once he has done their bidding, the beings leave his brain, revert to their own physical forms and reward the Enterprise crew handsomely for the trouble. All leave his brain, that is, except for one who's keen to tag along for interstellar adventures. A Norwegian/Canadian production, Me and My Moulton is Kove's autobiographical account of growing up with her quirky family in Norway. Like all children, she finds her parents embarrassing - Dad is the only man in town with a mustache - but feels lucky, in the long run, to grow up in a loving home. The artwork is very simple, almost like a comic strip. Disney's submission, Feast is a dog's perspective on his master's love life. We first saw it in theaters when it was distributed in conjunction with Big Hero 6 this past fall. This one was clearly the audience favorite at the Savoy as they laughed heartily throughout. In terms of story, this British production was a bit of a downer. It tells the tale of two brothers coping with their aging and dying mother. 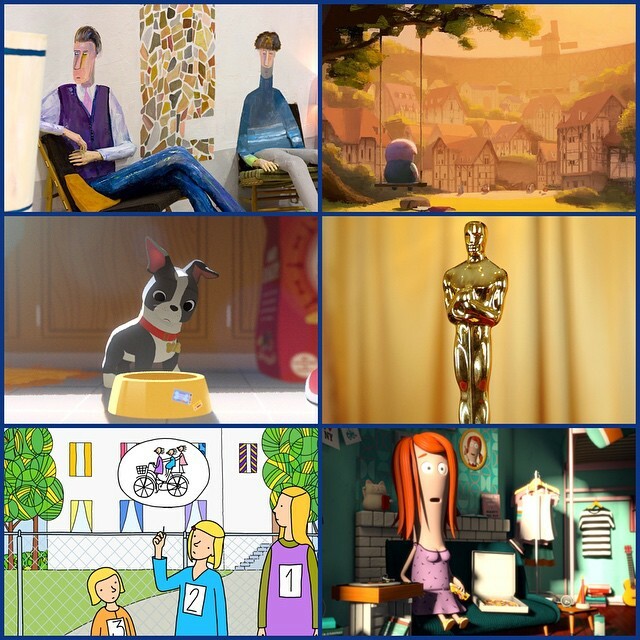 The Bigger Picture has the most inventive animation of the five. While most objects are filmed in stop-action, people appear as if drawn on the wall in crayon. Depressing but interesting. The zaniest of the five, A Single Life is a Dutch film of a woman experiencing the sweep of her life as she goes forwards and backwards on a 45 rpm record. This one's short indeed, only two minutes long. An American production, The Dam Keeper is sort of a combination of Wonder and Hugo. The unnamed protagonist is an orphaned pig who maintains the town's dam. He is bullied at school. One day, a cool kid befriends him, then breaks his heart - or so he thinks. My wife and daughter both liked Me and My Moulton the best. The Dam Keeper started very strong but lost me by the end. I don't care for heavy-handed depression metaphors. None of the movies blew me away but I'd probably pick Feast as the best. One senses it will win but it would be really cool if A Single Life won. It was the second-favorite for all of us. For what it's worth, last year's crop was stronger. MOCK! 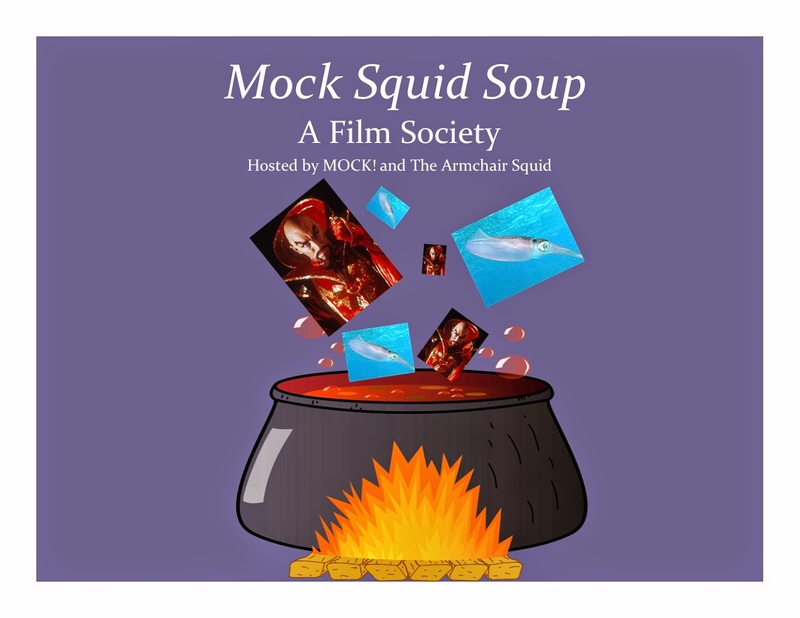 and The Armchair Squid are proud to present Mock Squid Soup: A Film Society! Our society shall convene next on March 13th. We are going to try a new format this month, suggested by the wise and wonderful Nancy Mock. Instead of selecting one film for all to watch, everyone is invited to write a review of any movie they would like to share. Then a wrinkle: in April, each participant will pick one of the other people's movies to review. I've already made my selection and I'm eager to see what other people choose. Years ago, I listened to an interview on NPR of the guy at Netflix who was in charge of their algorithms for movie recommendations. Out of all the DVDs in their endless catalog, there was one movie they just couldn't figure out: Napoleon Dynamite. They could detect no pattern in customers' other preferences that would indicate whether or not they would like the movie. There was no other film for providing a meaningful comparison. Hess's creation was unique. 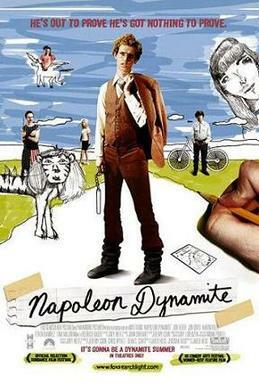 Napoleon Dynamite is one of the great small budget success stories in the history of cinema. Made on a budget of $400,000, it pulled in over $46 million at the box office. The titular character is a misfit teen in rural Idaho. He is ridiculed and abused at school. He struggles even to make friends let alone find dates. His socially awkward family is no help at all. It's the basic template for hundreds of teenager tales. Yet Napoleon Dynamite is unlike any of them. Dialogue is sparse. Idaho's low horizon landscape provides a stark contrast with the usual cookie-cutter, suburban backdrop. Napoleon only barely manages to be a sympathetic character. Through all of the considerable awkwardness, the story works. Napoleon's weird quirks like being a milk-tasting expert and a tetherball enthusiast are endearing. All builds to a glorious climactic scene: Napoleon's impromptu dance performance after best friend Pedro's limp-flounder campaign speech. Even with lukewarm feelings for the rest of the movie, it's hard to stifle an emotional reaction to that scene. Is Napoleon Dynamite a great movie? I don't know. For me, it's impossible not to have some admiration for a work of art in any medium that transcends comparisons. I also love knowing that future generations will look at photos from the era and puzzle over the "Vote for Pedro" t-shirts some of their misfit ancestors were wearing. All that said, parts of the film are challenging to endure. I'm not a huge fan of social discomfort humor and Napoleon Dynamite is dripping with it. I suppose I can rest easy knowing my middle-of-the-pack rating won't have the slightest impact on my Netflix recommendations. A new idea. Instead of selecting one film for all to watch, we're going to try a Cephalopod Coffeehouse style arrangement. Everyone is invited to write a review of any movie they would like to share. Then a wrinkle: in April, everyone will pick one of the other people's movies to review. Many thanks to the boundlessly wise Nancy Mock for the idea! In the meantime, for the Napoleon Dynamite discussion, please sign on to the list below. As I approach the end of my journey with Star Trek's original series, one undeniable truth has become apparent: a good many of the better episodes are Spock episodes. "All Our Yesterdays" is one of the best I've watched in a while, not easy for me to admit as it's a time travel story and I generally don't like Trek's time travel stories. But any story where we get to see past Spock's Vulcan stoicism is a treat. In "All Our Yesterdays," he falls in love. Our heroes - Kirk, Bones and Spock, that is - arrive at Sarpeidon to save its population from a supernova. Funny thing, though: everyone's already gone apart from the librarian Mr. Atoz and his clone assistants. All of the planet's inhabitants have used Atoz's Atavachron to travel to a time period in the world's past in order to spare themselves from extinction. In their own toying with the device, Kirk travels to one era while Spock and McCoy end up in another. Spock and the doctor find themselves in an ice age where they encounter a beautiful woman, Zarabeth, who provides them shelter. Zarabeth was exiled to this time by a tyrant. She believes the Atavachron only works in one temporal direction and therefore, her new friends are trapped with her as well. Spock's reaction to the predicament is dramatic. He lashes out at McCoy and struggles to resist Zarabeth's advances. Emotion has prevailed over logic and astonishingly, the half-Vulcan is faced with a rare burden, at least for him: uncertainty. Pretty good stuff, particularly by third season standards. Unfortunately, the reason given for Spock's failings detracts a bit from the story. Having traveled back 5,000 years in history, he is reverting to the more savage and violent nature of his Vulcan ancestors of that time period. The explanation doesn't sit well with me. No matter the time in which he finds himself, Spock is still Spock, surely influenced more by his own life experience than some societal reality drifting across the cosmos. I think the simpler explanation would have been better: even Spock has his limits. The future appears bleak. One of his only two companions for eternity is a man with whom he has a trying relationship. The other is a woman both desirable and willing, yet logic dictates that he must deny himself her charms. Understandably, he cracks. In this, the original series's penultimate tale, we finally get to see the human Spock with all of his earthly flaws. Mariette Hartley (Zarabeth) was born June 21, 1940 in Weston, Connecticut. She was born into an intellectually prominent and highly troubled family. Her maternal grandfather, John B. Watson, established the psychological school of behaviorism. His theories were applied literally in the life of the family and Hartley cites this is a source of great dysfunction. Like so many I've featured here, Hartley's acting career began on the stage. Her first film role came in 1962's Ride the High Country. Other early big screen gigs included the lead in Drums of Africa and a supporting role in Hitchcock's Marnie. Her television credits are extensive. In addition to many guest appearances, she's had regular roles on The Travels of Jamie McPheeters and Goodnight, Beantown. More recently, she has had a recurring role on Law & Order: SVU. She still gets stage work to this day. In 2014, she performed Eleanor of Aquitaine in The Lion in Winter. In 1978, she won an Emmy for her work on The Incredible Hulk. In recent years, Hartley has written and spoken extensively on issues of mental illness, discussing her father's suicide and her own struggles with bipolar disorder. The animated film Sita Sings the Blues entwines two tales: Ramayana, a classic story from ancient India, and the autobiographical account of creator Nina Paley's marriage. Ramayama is presented as a refreshingly irreverent discussion between three shadow puppets. Interspersed are musical episodes, in an entirely different animation style, performed by Sita as voiced by recordings of Annette Hanshaw, a Jazz Age singer who passed away in 1985. The Purple Penguin is no stranger to Ramayana. In fact, of the three of us, she is the most knowledgeable in regards to Indian mythology. A few years back, we discovered the work of Sanjay Patel, a Pixar animator who has written and illustrated several children's books on the subject, including an adaptation of Ramayana. As such, she was able to identify the Hindu gods we didn't know. The movie's a lot of fun. The animation, music and voice performances are all excellent. The autobiographical portions are the least interesting for me but the parallels Paley draws between her own story and that of Sita are meaningful. "The Savage Curtain" is an interesting episode - less for the story itself than for the history it supplied for the Trek universe. In a now typical morality play, Kirk and Spock are pitted against evil forces for the amusement - or in this case, the intellectual enlightenment - of superior beings. Our heroes have company on the "good" side: mysterious incarnations of Abraham Lincoln, Kirk's personal idol, and Surak, the father of Vulcan civilization. Lining up on the baddies' side are Genghis Khan and three new faces: Colonel Green, a genocidal despot from 21st century Earth; Zora, a eugenicist-type from the planet Tiburon and Kahless, the forefather of the Klingon empire. Surak, Green and Kahless all feature in later spinoff series stories. Creator Gene Roddenberry wrote this episode himself. The idea of humanity proving its moral worth was clearly important to him as it often comes up in his stories, well into The Next Generation. In March 1969, human science was on the brink of reaching the moon. We were ready. But, Roddenberry wondered, did we actually deserve it? Lee Bergere (Lincoln) was born April 10, 1918 in Brooklyn. For those keeping score at home, he's the second native Brooklynite in a row to be featured in this space. His acting career began on stage as an understudy to Danny Kaye in Lady in the Dark. During World War II, he served in North Africa, supervising entertainment services for the troops. Most of his work was on television. His best-known role was Joseph on 56 episodes of Dynasty. One of his few other regular gigs was as George on Hot L Baltimore. The series, starring James Cromwell of all people, only lasted for 13 episodes but George was one of the earliest gay characters to appear regularly on an American TV show. Bergere retired from acting in 1989. He died in 2007 in New Hampshire from undisclosed causes. Manga Shakespeare, published originally in Britain, is a series adapting the plays of William Shakespeare to Japanese-style comic books. 14 works have been given the manga treatment so far, all including abridged, though original texts. 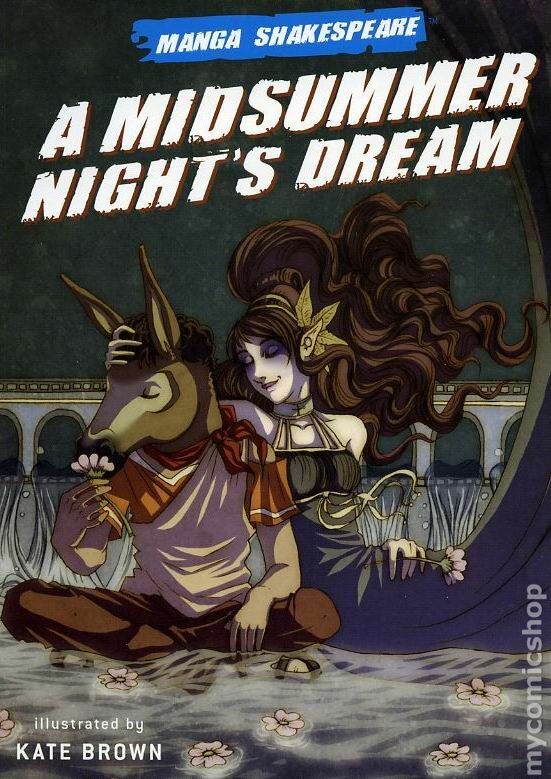 A Midsummer Night's Dream was my introduction to the series. A Midsummer Night's Dream was the first installment in my 12 Books in 12 Months project a few years back (post here). While I've seen many of Shakespeare's comedies performed on stage or screen, it's the only one I've ever read. The purist in me wants to see the full text in a comic book adaptation as was done here. But if the idea is an accessible intro, I prefer abridgement to the No Fear Shakespeare concept in which the original text is translated into "modern" language. There's no reason why Shakespeare comics shouldn't work. Theater is, after all, a visual medium and therefore sequential art is an obvious choice for adaptation. The artist, while working in the manga style, is herself British. The character drawings are very manga-esque as are the panel layout and the women running around in their underwear. I would certainly be interested in reading more of this series, particularly the plays I don't know so well. My dear pal Cherdo nominated me for the Very Inspiring Blogger Award. You know that friend you sit with during boring meetings because she makes snarky comments that preserve your sanity? That's Cherdo. If you're not already following her blog over at Cherdo on the Flipside, you're missing out on the good stuff. Thank you for the award, my friend! 1. Thank the person who nominated you, and link to their blog. 2. Display the award logo. 3. Nominate 15 other bloggers (more or less) and provide a link where they may be found. 4. Go to their blog, leave a comment to let them know they have been nominated. 5. Mention three things that inspired you the most during the past few weeks. 1. The Show. Last week was Show Week at school. On Thursday night, we opened our middle school musical: Wonka, Jr. This was the fourth musical and the sixth play overall that Drama Guy and I have directed together and while it is a lot of work, there are always many inspirations along the way. In My Wife's analysis, our Oompa-Loompas stole the show. Out of necessity, one devotes a lot of time to the leads in a play and ours did just fine. But when the ensemble can hold up their end and make the most of their own moments, you know your program's heading in the right direction. 2. The Concerts. My daughter has been a daily source of inspiration from birth. Now in 5th grade, she's busy with her own performing arts endeavors. In recent weeks, it's been school concerts: band (alto sax) last week, chorus two weeks before that. In total, she performed in five ensembles: 5/6 chorus, 5-8 chorus, African drumming ensemble, 5th grade band and 6th grade band. Through it all, she always looks confident and, more importantly, happy. Now she wants to teach herself to play the harmonica. Her music teachers think this is all my doing but in all honesty, I do my best to stay out of her way. Go get 'em, kiddo! It tasted just fine, I swear! Dancer Jerry Travers (Fred Astaire) and fashion model Dale Tremont (Ginger Rogers) are falling in love. The only problem is that Dale mistakenly believes Jerry to be Horace Hardwick (Edward Everett Horton), husband of her friend Madge (Helen Broderick). Screwball comedy ensues. Who am I kidding? This is a Fred & Ginger picture. Story's just a garnish. This movie's all about the dancing. 80 years after this, their most successful film together, Astaire and Rogers are still the most famous dance partners in Hollywood history. The pair made ten movies in total and Top Hat is generally considered to have the strongest story. Astaire, often frustrated by the way his dancing was filmed, appreciated Top Hat for the full body shots. Too often, his dances were only filmed from the waist up - ridiculous for a tap dancer. Irving Berlin wrote the songs, "Cheek to Cheek" being the most famous. "The pleasure of rooting for Goliath is that you can expect to win. The pleasure of rooting for David is that, while you don't know what to expect, you stand at least a chance of being inspired." "You can't play Electro-magnetic Golf according to the rules of Centrifugal Bumble-puppy."